It's getting cold her in NYC, and it just reminds me of how much I hate the cold. I'm not ready to break out the heavy coats yet! Not to mention the bus drivers at the MTA haven't figured out which button turns on the heat, so while it's 38 degrees outside, it's also 38 degrees inside....this makes for one un happy commuter. Fortunately, there is one silver lining, as I shiver on my bus ride home. Thanksgiving. It's my favorite holiday, mainly because its a holiday that celebrates food. And any holiday that has you eating a plethora of comfort foods all day long is a holiday I can really get behind. So as the holiday season ramps up, along with my waistline... 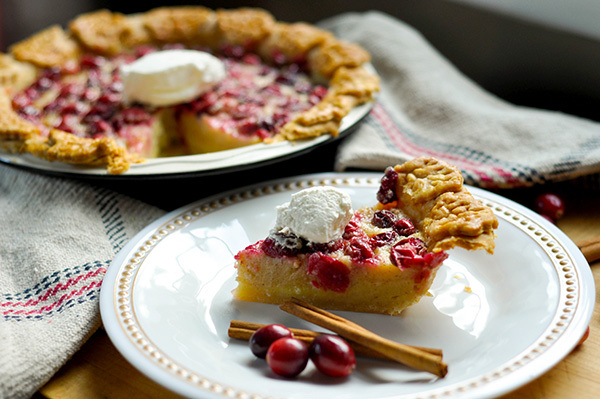 I'm ramping up my pie game, with this Holiday spiced Cranberry Chess Pie! For this recipe I decided to try my hand at a different pie crust. I made it half and half lard and butter. Lard for the insane flakiness and the butter for flavor. I think this is truly the best pie crust. All butter is fine, but the texture lacks the flakiness I crave. The addition of lard solves this problem! This crust is rich, flavorful and flakey. It's my new go to! For the crust I cut the butter and lard into the flour. Once the fat pieces were the size of pebbles (some pieces were small, and some were larger) I added in the egg, apple cider vinegar and ice water. I mixed this together with a rubber spatula and once it started to form a ball, I turned it out onto a floured board and kneaded it slightly to create a cohesive ball, working quickly to make sure the butter and lard didn't melt away. Once I got my ball, I cut it in half, shaped each half into a flat disk and wrapped it up in plastic wrap. This gets chilled in the fridge for at least an hour. I blind baked this crust to create a crispier crust. Roll out one half of the dough and gently place it into your pie pan. Press it down, crimp the edges and prick the bottom with a fork. Then pour beans, or pie beads into the bottom of the crust. Bake this at 425F for 15 minutes. For the filling, I wanted a sweet custard to contrast the tart cranberries. Chess pie was jus the thing. Smooth, sweet and creamy. But I had to doctor it up for the holidays. Buttermilk gave it a great tang and I added nutmeg and cinnamon to really make punch up the holiday flavor! This really became something delicious! And so easy to make! This custard is a simple mix of sugar, eggs, flour, buttermilk, and butter. I mean, really... how can that not sound delicious! Whisk those ingredients together and pour it into the blind baked pie crust. I then carefully dotted the top of the pie with the halved cranberry pieces. And being the OCD crazy person that I am, I had to make sure they were all turned the same way... bumps up so that we can see that gorgeous cranberry color. I mean doesn't it just look cuter that way? Bake this up at 350F for 20 minutes, then lower the temperature to 325F for another 20-25 minutes. The custard should be set but jiggly. I topped the cooled pie with fresh whipped cream and thats all it really needed it. 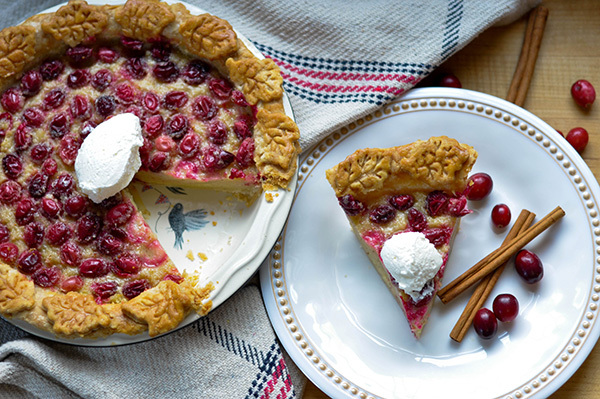 a flavorful flakey crust, filled with a sweet and tangy cranberry custard. It's so so good! You defiantly need to add this to your Holiday repertoire! Whisk flour and salt together until combined. Cut the lard and butter into the flour until you get small pebble sized pieces. I like to keep the size a bit irregular so you get some small pieces and some larger pieces of fat. Add the egg, apple cider vinegar and ice water. Mix with a rubber spatula until it starts to come together. Turn the dough out onto a floured surface and knead slightly to really bring it together. Work quickly though to prevent the butter/lard from melting. Form into a ball and cut in half, then shape each half into round disks and wrap in plastic wrap. Allow to chill in the fridge for at least an hour. Once chilled, take out one disk and roll into a 10" disk. Transfer this to your pie pan and gently press it in. Cut off any excess crust and crimp the edges. Blind bake the crust. Prick the bottom of the crust with a fork and add dried beans or pie weights to the the bottom of the crust. Bake at 425F for 15 minutes or until lightly golden. Take out the weights and allow to cool. Pre Heat oven to 350F. 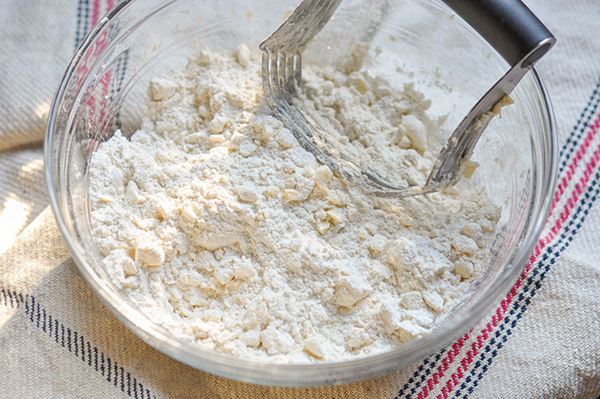 In a bowl, whisk together sugar, flour, and salt. In a separate large bowl, whisk together eggs. Add dry ingredients, along with buttermilk, cinnamon and nutmeg. Whisk until combined. Whisk in the melted butter last. Pour the custard into the pie crust and dot with the halved cranberry pieces. Gently transfer to oven. Bake 20 minutes, then reduce oven temperature to 325F and bake for another 20 to 25 minutes. The center should be set but still slightly jiggly. Place on a wire rack and let cool completely to room temperature, at least 2 hours. Serve immediately or refrigerate until ready to serve, topped with freshly whipped cream.